Book reviews, musings over words and the writer life, anything related to my life-long word love affair. "No mourners . . . No funerals . . Among them, it passed for 'good luck.'" Man, I liked this book a lot more than I expected. It kept popping up everywhere on social media (specifically Instagram), and everyone seemed to rave about it, so I thought I might as well see if it lived up to its hype. This book deserves the hype, I am pleased to say. It felt fresh and original, unlike so many Young Adult books people praise. There are so many things Bardugo does well, like character development, world building, and overall mood. I loved how each of the six main characters was well-developed and fully explored, and that everything about the characters was not revealed all at once, but gradually explained. This left me, the reader, desperate for more answers. Why does Kaz always wear gloves? Why does Matthias seem to despise Nina? All questions that kept me flipping the pages at rapid speed. Each character had a rich backstory and unique motives and personality. And, the characters aren't your typical "good guys." They're a rough bunch of kids who are lawbreakers and criminals, but you're drawn into their struggles and victories. You sympathize for them and relate to their struggles, even if they're not identical to your own. Kudos to you Bardugo, for avoiding the overused "stock" characters like the I'll-do-anything-for-love girl or super-dreamy-but-broody guy. Her girls have backbone and don't change for the guys, and her guys don't know how to woo the girls. No Don Juans here, no slick charm, thank goodness. World building and tone kind of go together. I love that the author went as far as creating not one, but two maps for the book. You gotta love a book with maps. In addition to the normal "human" world of Ketterdam, she also develops other realms such as Fjerda and Ravka. 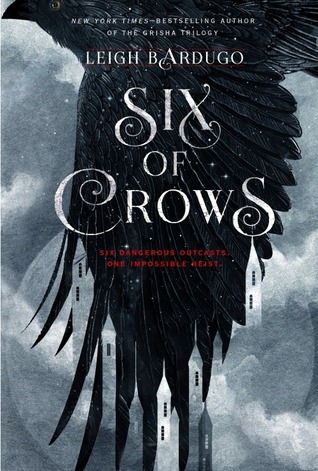 Each is distinct with its own culture and vibes, and the way Bardugo ties in what seems like Scandinavian names and culture makes it feel even more real and believable, especially with the names of her people and places. Ketterdam, the city most like our world, has a distinct feel to it. As I read, it reminded me of the overall aura of movies like V for Vendetta or the Robert Downey Jr. Sherlock Holmes, with that distinct gritty and greyed ambience. I loved it, because I could picture the world vividly in my mind's eye, almost like a movie, but better. The plot pacing was perfect. There were multiple plot twists and surprises that I didn't see coming, and well-timed character revelations up to the very end of the book. Speaking of the end, I have gone and purchased the next book ASAP, because I don't have the patience to wait on my library's copy. It was that good. "Better terrible truths than kind lies." "The heart is an arrow. It demands aim to land true." "There was no part of him that was not broken, that had not been healed wrong, and there was no part of him that was not stronger for having been broken."